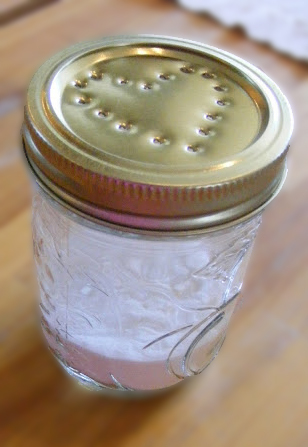 Use the hammer and a nail to poke some holes in the lid of the jar. Design a pattern, or simply just scatter some holes randomly. Fill the jar to about 1/4 full with Baking Soda and add between 6 and 8 drops of your favourite essential oil. I used lavender oil. Ta-da! You’re done! All you have to do now is to place it somewhere that you feel needs “freshening” up a bit… Bathroom, under the kitchen sink… How about in the towel cupboard?. I suppose you could even decorate the outside of the jar with Sharpie’s or scrapbook paper if you so desire… Just don’t forget to give it a little shake when you want the scent to “strengthen” up a bit. Simply shake the mixture onto your carpet, leave it for 10 minutes or so, then vacuum it up! Oh… One final warning. Keep out of reach of children.